When less is more, in the wind department at least. I won’t think about that for now. Did I say that the wind is less today? Yahoo!!! We were beginning to think that that the wind was NEVER going to drop to a reasonable level as it has been one front after another for the last two months that we have been in the Bahamas. However, it seems that there’s light at the end of the tunnel as Chris said this morning that the coming week should be BEAUTIFUL with winds in the southern Bahamas from a reasonable direction and in the 15kt range with no major fronts likely to penetrate this far south. That’s good, very good. With that in mind, it looks like we will be heading east to Thompson Bay Long Island on Sunday afternoon or Monday morning. After that we will likely head southwest to the Jumentos as I talked about in yesterday’s post. Today we’ll probably head back into town for a few chores and yet another visit to the BATELCO (Bahamas Telephone) store to try and sort out the problems of calling my mother. She is the ONLY person I call that has a land line and for some reason I cannot get through to her number on my Bahamas cell phone. Unfortunately, the BATELCO folks can’t seem to figure this out and we have tried everything to solve the problem. For a while we thought it was the phone so I purchased a new one. It worked in the store but not back at the boat. Very frustrating. And, to make matters worse, each time I try to call her and it doesn’t go through I still get charged for the call. Speaking of traveling home to see my mother, I have been working on getting crew for the run from Nassau to Essex in May and after a month or so of corresponding with folks back in the States, I think I am about set. As most folks have limits on the time they can be away, I will likely make a crew change along the way, probably in Beaufort NC. Last year I made the 1,000 mile run without stopping but this year I’d like to be a bit more leisurely about it as keeping Pandora on the run for nearly a week without a break is a bit tiring. Perhaps I am getting old. No, I prefer to think of it as “effort management”. Yes, that’s better. Well, the sun is up and getting higher and the day is getting away from me. No exciting pix to share with you. No, wait. 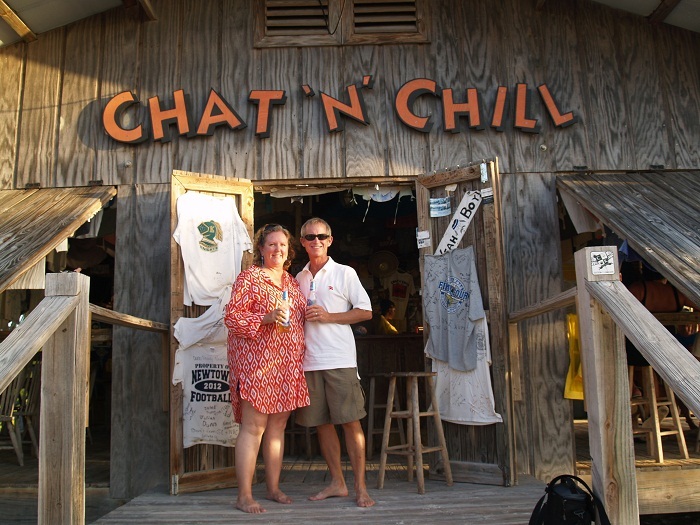 Here’s a nice shot of me and Brenda in front of the local beach bar when we visited last year. Chat and Chill. Now, doesn’t that sound like a “it’s the Bahamas mon” sort of place? And a view from the bar. Yes, a good spot to “chat and chill” from. And, of course, there are some very helpful signs to be sure you know how far you are from just about anywhere. That’s very comforting. It’s Friday mid-morning and we are yet again sitting at anchor waiting for the wind to settle down as yet another cold front passes through the area. I know it’s Friday because I listened to the Cruisheimer’s SSB radio Net today and they told me so and I also consulted with my calendar. When you don’t have a weekend to look forward to, with two days off, it’s very easy to forget which day of the week it is. I am hopeful that it’s spending time aboard cruising that is causing me to loose track of what day of the week it is and not something more sinister. I’m not going to focus on that right now. “Quick Bob, what year is it?” Uhh…..2014? There, not so bad. I guess you’ll have to take my word for it that I don’t have a tear-off calendar near the nav station on Pandora. “Bob, Bob, where are you going with all this? Snap out of it and get to the point.” Ok, OK, thanks, I needed that. It’s Friday….. No wait, I already said that. Yes, it’s plenty windy with sustained winds, let’s call them “fresh breezes” in the 20s with higher gusts. That’s a bit much and with a wave fetch across the harbor, the water is kicking up a bit here in Georgetown. Chris Parker, the weather router we use said, on this morning’s weather forecast on the SSB radio, that this cold front is likely to be the last really strong one to hit us in the Bahamas this season. Yes, there’s another one coming through on Sunday but it’s not likely to be anywhere near as strong as this and prior fronts have been. It’s high time as April is just around the corner (see, I do know what day of the month is) and springtime calmer conditions should begin to dominate. That’s good as we only have a month left on our cruise and I’d love to be able to move around a bit prior to heading back to Nassau and the US. In particular, we would like to visit the Jumentos and Ragged islands which are south west from here. This part of the Bahamas is much less traveled by cruisers as there very few good harbors and getting there can be challenging. With no settlements along the chain, we will be on our own with know one to help us if we get into trouble. We will actually have to travel southeast to Long Island when the winds shift to the west with the coming cold front on Sunday and then wait till the easterlies fill in again and then head to the southwest and on to the Jumentos. These two lsland chains are about 50 miles long from one end to the other, not a very long distance and are laid out in a crescent that runs on a gentle curve in a northeast to southwest direction. Once you get to Duncan Town, at the very most west portion of the Raggeds, you are within 50 miles of Cuba. Now, that’s a spot we’d love to visit. We have met quite a few Canadians and a few Americans who have visited there. Perhaps we will soon be able to go. Washington? Are you listening? Visiting Cuba is at the top of the list for Brenda. Me too. Yesterday Brenda and I took some time to go ashore and had lunch a nice little resort here in Georgetown called St. Francis. They serve simple lunch fare on a beautiful deck overlooking the water. This view is pretty representative of just how beautiful it is. After lunch we headed out to the nearby ocean beach to watch the waves crash ashore. The beach was about two miles long and we had most of it completely to ourselves. Even with 100 boats anchored nearby, most everyone stayed aboard given the wind. With the very strong onshore winds and waves, we were pretty well coated with salt when we returned to Pandora. Happily, I had filled our water tanks with the reverse-osmosis (watermaker) earlier in the day so we were free to shower and clean up. I love, LOVE, our watermaker. Brenda? Love isn’t strong enough to describe how she feels about it. So, what’s on for today? Not sure but I do have a good book. Not too much on the agenda here in the warm and sunny Bahamas when the wind is blowing. Good thing we aren’t in a rush. Sorry though, for not including any great shots of sunsets, turtles, shells… You’ll just have to check old posts for more scintillating pix. It’s Wednesday evening and I thought it would be good to do a short post prior to hitting the rack. In the interest of truth, I had to look at the date on the computer to recall what day of the week it is. I guess that’s good as I am not working these days. Yes, it’s acceptable when you are in crusing mode not to know what day of the week it is. However, if you are in a “land home” you are assumed to be “confused”. I prefer relaxed, personally. Not quite ready to be “confused”. Today was the first day of the passing of the most recent cold front, a weekly occurence. As we are further south, the effect was a lot less severe with the west winds only lasting for a few hours. In the northern portions of the Bahamas the winds are a lot more nasty, stronger and from the west for longer. I am happy to be in Georgetown as the passage of the front is a much less of an issue than up north. That’s good. Now that the front has passed the winds are back to the east which means that most all of the anchorages are protected but the winds are still very strong. The forecast calls for winds gusting to near 30kts on Thursday and the strength of the winds are not expected to diminish until Sunday. By that point we will be totally ready to “get out of Dodge” as Georgetown is a bit too organized for our taste. They actually have announcements on the radio each morning here as there is so much to do. It’s sort of like adult camp, or day care. At least day care for retired “A” types, not always a nice combination. Our next destination, once the weather improves and the wind strength becomes more reasonable, is likely to be the Jumentos as we have not yet visited that part of the Bahamas. They are south and west of where we are now and quite close to Cuba. The Jumentos are very remote with the smallest fishing settlements and only a hand full of people on any given island if there is anyone at all. One key requirement, if you are going to visit this area, is to be fully self-sufficient. This means that you have to bring all the food you will need along with all your own water. Happily, we have a watermaker which will keep us going for a long time without a visit to any sort of water source. Fresh food, that’s another issue as it only keeps so long. So, when will we leave to visit there? Probably not till the weekend or early next week. That’s when the winds are supposed to subside and turn to favorable direction. Due to the fact that much of the area in the Jumentos is very shallow, we will have to go quite a bit out of our way to get there as the more direct routes are just to shallow. If we play the tides, making a point to move at high tide, we might make it through the closer route. However, we might not and to run aground in shallow water would definitely ruin our day. With that in mind, we will have to take the safer “long route”. We have been told that the Jumentos are very beautiful but wild and quite remote. If you are into spear fishing for lobster and fish, you have to be prepared to deal with sharks. It’s not prudent to spear any fish if you are not close to your dink so you can get out of the water pronto when you catch something. Spear a fish and you are sure to attract sharks within minutes. Not my first choice as I’d prefer not to be fish food any time soon. And, these sharks are the “real ones” with the pointy sharp shark teeth. A friend told me he was fishing and when he got his “catch” to the boat all that was left was the head. The rest of the fish was “shark bait”. Better them than me. Unfortunately, the lobster season closes March 31st, just a few days from now, so fishing for lobster won’t be on the agenda. I am told that there are many in the area so it is unfortunate that we will miss the season. Perhaps next year we will go there earlier in the season. I hope that the weather will support a run down to there as it’s a place that I really want to visit. Fingers crossed. On a more local note, today the wind in Georgetown was really strong and Pandora pulled hard on her anchor all day. I spent a good deal of time reading in the cockpit, enjoying the view. Several times a really big turtle, some 3’ across swam buy. Getting a photo of these guys is notoriously difficult as they tend to stick their heads up and duck from sight in a blink of an eye. 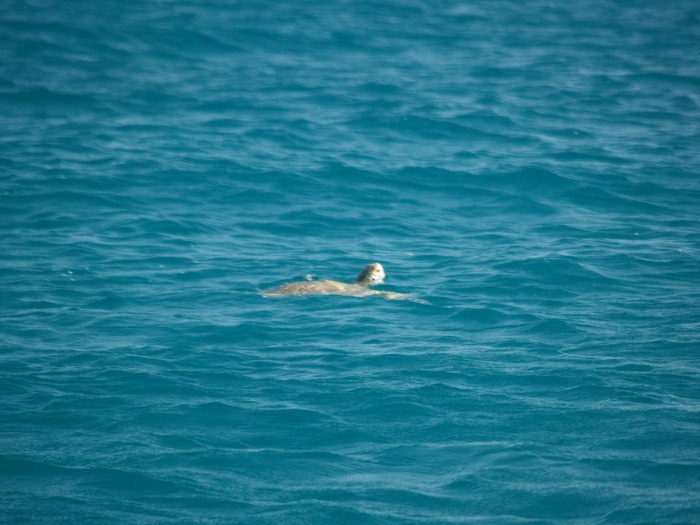 However, I was able to get my first “turtle sighting” photo. Here it is. Not terribly exciting for you perhaps but it was for me, so there. Thursday we plan on doing a bit of beach combing and some shelling. Perhaps lunch out at one of the local resorts. Wind or not, I am looking forward to getting off of the boat for a few hours. One thing for sure, it will be plenty windy with sustained winds in the mid 20s and gusts to 30. That’s too much wind, actually. However, at least these winds are in the 80 degree range. It sure beats a winter storm with sub zero temps. Yes, warm is good. And did I say that it’s sunny? If not, I am saying it now. It’s sunny, really sunny. Don’t forget your sunscreen. The Bahamas are magic, really! 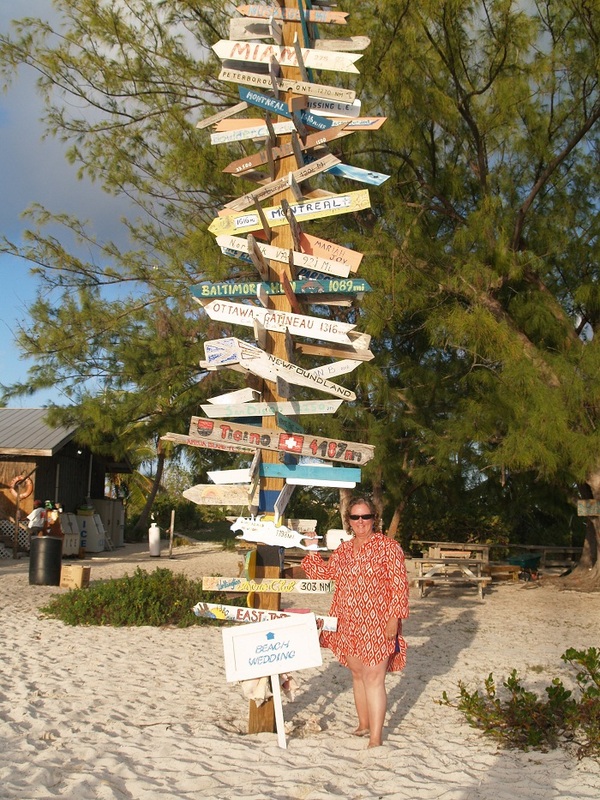 It’s Tuesday and we are all the way down south in Georgetown, the largest “town” in the southern part of the Bahamas and a very popular harbor with cruisers. At present I’d guess that there are perhaps 100 boats anchored here so, as you can imagine, there’s plenty going on. While 100 boats may sound like a lot, it’s late in the season and many have already left. A month ago I expect that there were three times that many boats hanging out but many have left to head north to the States or south to work their way down to the Caribbean. Needless to say, with this many boats in one place for the winter, things are pretty organized. Each morning there is a VHF radio net where local businesses announce their offerings and cruisers trade and sell spare items that they have on board. It’s amazing how much extra stuff folks have on their boats that they don’t actually need. I guess that boaters are packrats, just like land folks, but with less space. Anyway, as you might recall from past posts, I damaged my main anchor some time ago when I got it lodged under a ledge up near Staniel Cay. The shaft was bent 90 degrees so the anchor is “mort”. As I like to have a spare of many items myself, I announced, on the morning radio net today, that I was looking for an anchor. Well… It seems that some folks collect anchors and, for the right price, might be willing to part with one. Within a few minutes I got calls from a number of boats offering their wares. I’ll have to check them out and settle on one. One caller told me that he has six anchors on his boat. That’s a lot of anchors as most boats have only two or three at most. I wonder how much other stuff he has on board. Lots, I’ll bet. On Sunday night Brenda and I anchored off of a lovely Cay (that’s pronounced Key in the Bahamas, Kay in the US), Musha Cay. 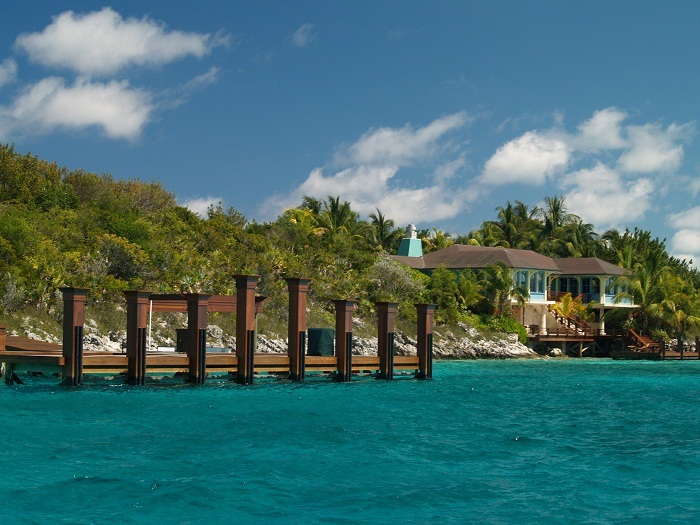 Interestingly, the island, and others nearby, are owned by David Copperfield, the magician. I guess that being a magician pays well, and let me tell you, this is a VERY nice spot. And, along with being a talented magician, our “neighbor” David has very nice taste. Beautiful. We understand that you can rent the island, Musha Cay for about $25,000 per day, and it would seem that plenty do as the place was hopping while we were there. 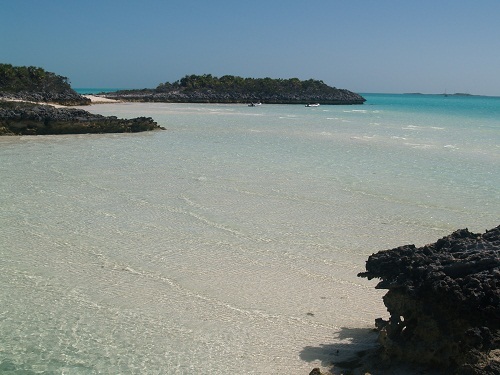 There are plenty of privately owned islands in the Bahamas, actually too many are private, but there are only a handful of spots that are as nice as this one. The buildings are quite impressive. Actually, i understand that this is the dining room area. Check out the nearby dock. No simple pressure treated pilings here. They just won’t do For our David. Check out the water color. The place is spectacular and it seems that there is much more here than meets the eye, as you would expect from a magician. Check out this article from Forbes magazine. It’s worth reading. Yes, quite a place And you can even get fireworks for $25,000. 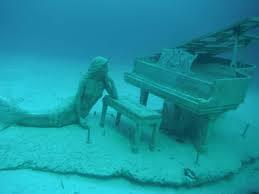 As a particular point of interest, David Copperfield had a full size grand piano with a reclining mermaid commissioned out of stainless steel and then sunk it off of his island. I was able to dive on it with some new friends we met who were from France And Belgium. They took me in their dink, complete with a 40hp motor, off to visit the piano. The currents were fierce and swimming down to the piano was a bit challenging. I took some videos but can’t post them. Here’s a photo I pulled off of the Web. 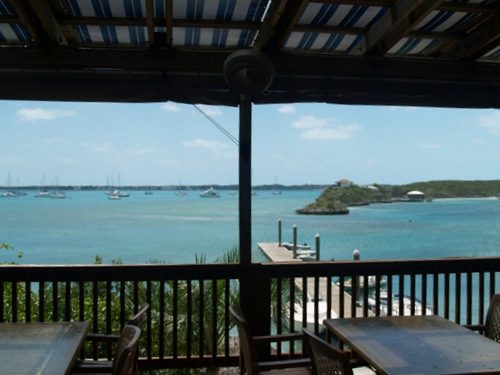 The “main” house is up on the hill and is quite a bit larger and has a commanding view of Exuma Sound. This is a shot that I took from the ocean side as we headed down toward Georgetown yesterday. I’ll bet that a G&T or another “adult beverage” (of course included with the rental) would taste great on the deck in the evening. I’d guess that sunrise isn’t too shabby either. And, don’t forget, all materials to build anything on one of these remote islands have to be brought in to the Bahamas and then reshipped to the island by landing craft. It’s a complicated process and plenty expensive. Expensive? I can only imagine. I guess that as JP Morgan once quipped, “if you have to ask, you can’t afford it”. David Copperfield, it seems, doesn’t have to ask. However, he does rent out the island. Only, of course, if you can afford it. Me, I am one of those who DO have to ask what things cost so I’ll never know. What a spot. As the sun rose on Monday morning I watched a crew of three get out on the beach and rake every inch by hand to remove any seaweed that had washed up on shore overnight. Pretty amazing. And, at night the docks have blue underwater LED lights that flash in a very nice way all night. I would expect nothing less from our buddy David. Of course. So, on Monday morning at 08:00 we headed out to make the run to Georgetown, the largest town in the central Bahamas to re-provision and to get ready for our last month out prior to meeting up with our son Rob and his girlfriend Kandice back in Staniel Cay in late April. Our plan was to make the 40 mile ocean run down to Georgetown on a settled day. While we were only able to sail less than half of the way as the wind died, we did have a really nice run. One thing that I did, which seemed very decadent, was to crank up the watermaker (a desalinator that takes the salt out of seawater) and use a hose to wash off nearly two months of salt that had accumulated on the decks. Believe it or not, we have not had any rain of consequence for all that time. Things had become very salty, that’s for sure. So, with the watermaker cranking away, I washed the salt off of the decks and scrubbed away, all while motoring along in the ocean in conditions that were as calm as you can imagine. By the time we reached Georgetown a few hours later the tanks were full again. 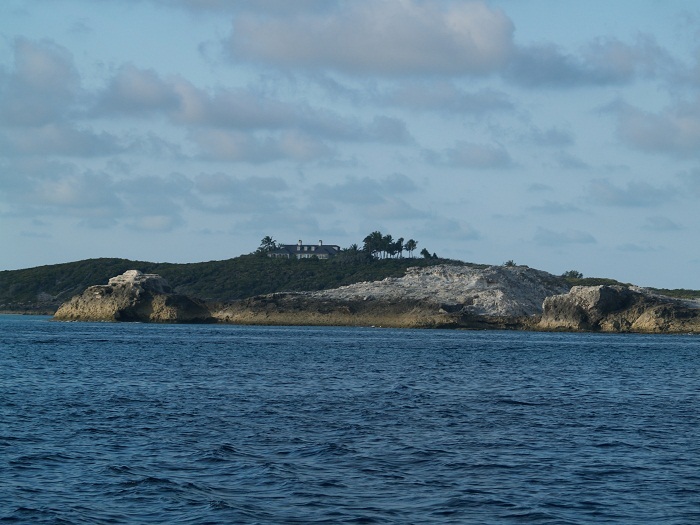 As a point of clarification, on the “bank” side of the islands, away from the ocean, the water is less than 20 feet deep for thousands of square miles, but on the ocean side, the water depth goes from about 40’ deep to, believe it or not, 3,500 feet deeP or more. That’s an impressive depth and what a drop off in only a short distance from shore. That’s some drop-off of 3,500 deep in less than a mile. Anyway, as usual, I digress. So we motored along in perfectly calm conditions and I washed off the boat as the watermaker happily cranked away replacing what I was squirting all over the boat. So, Pandora’s plenty clean now. And, tonight Brenda and I sat up on the bow to enjoy an “adult beverage” while watching the sun go down. Very nice. All and all, a very nice day on the water, and even Brenda liked it. Smooth and calm, her favorite. Today, in Georgetown we did provisioning and will be waiting for the next cold front to blow through. Hopefully, we will be able to head out by the weekend or early next week. Destination? Perhaps the Jumentos. Fortunately, we ran into a few of our friends who just got back from a month there. Very remote and beautiful, we were told. More to come on that, I would expect. It seems to me that there is plenty of magi pic in the Bahamas, David Copperfield aside. Reconnecting aboard. It’s a small (cruising) world indeed. It’s Sunday morning and a lovely one at that. Brenda got up early enough today to even see the sunrise. How novel. Usually it’s me taking photos of a sunrise so I can show them to her later. Today she saw it herself. I should note that Brenda loves sleep. She says that sleep is her “natural state”. Perhaps it’s a girl thing. If I were to sleep in too late I expect she would call EMS. Yesterday afternoon I happened to remark to Brenda that it seemed to me that we had not done much socializing on Pandora with other couples this season when compared to last winter in the Bahamas. Meeting up with like minded folks is one of the best parts of the cruising lifestyle and I was feeling a bit “under-exposed”. Amazingly, less than ten minutes later a dink pulled up to Pandora and there was Jerry, the friend and crew member of yet another Jerry, a guy that we had met on our way south in the fall of 2012, in Oriental NC. When we met “Oriental” Jerry over a year ago, he was planning to fly to the Canary Islands, off of Africa, to look at a boat that he was thinking of purchasing. Well, Jerry ultimately did purchase that boat and he, along with the “other” or “new” Jerry, who had stopped by to say HI, took delivery of his new boat, a catamaran, and sailed it to the Caribbean and recently up to the Bahamas. So, last evening we found ourselves in the same harbor with Jerry who we haven’t seen for over a year. What a small world it is. When “friend” Jerry, as opposed to “Oriental NC” Jerry stopped by, we were comparing notes about a small boat that had sailed into the anchorage earlier in the afternoon and anchored, all without turning on their engine. Most folks, including me and Brenda, pull our sails down before we get into a crowded anchorage. No need to complicate things in a tight field, by our way of thinking. So, to see a boat with two young people wind their way, under sail, through the other anchored boats and confidently drop their hook, was something we all noticed. I expect that’s why they did it, actually. A bit of hotdogging. And done well, I should add. It turns out that the “hotdoggers” were none other than a young couple we had spent time with in Rum Cay last winter. Rainbow Connection, a Bayfield 35, is owned by Jamel and Tania who are probably in their early 30s. Tania was born (literally born, I think) aboard and grew up on a sailboat as her parents sailed here and there, I believe around the world at least once. It seems that they are on their way to hook up with her parents who are still sailing around and are currently in Staniel Cay not far from here. 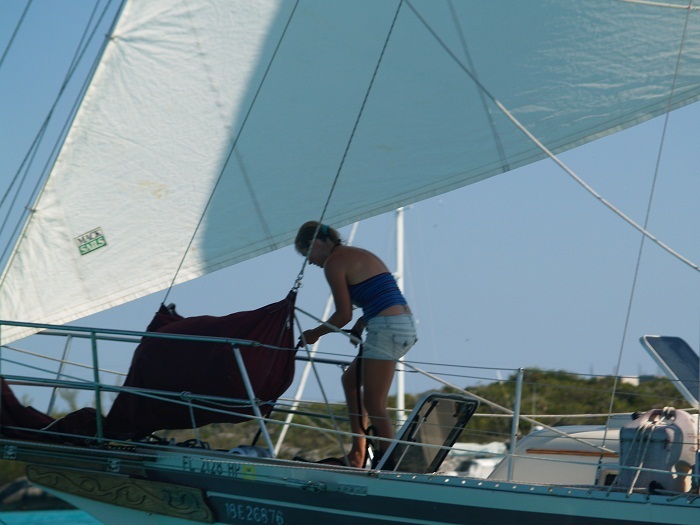 Here’s Tania working the foredeck and looking right at home. And Jamal at the helm. Looking very comfortable winding their way through the anchorage. Jamal and Tania spend winters sailing aboard their boat and summers working on a commercial salmon fishing boat in Alaska. Now, that’s not a combination that we see every day. Most couples we meet are retired or are taking a year off from work. However, we almost never see young folks who have managed to find a way to cruise and work in a way that seems sustainable. What these two have done is pretty neat. I couldn’t resist and took the dink over to say HI and invite them to visit us for drinks. We also had Jerry and Jerry visit too. It was a lovely time. And, as the sun set, Brenda did a terrific job of saluting the sunset by blowing the conch. And that was particularly fitting as we had acquired that conch when we were in Rum Cay with Jamal and Tanya last winter. I have written before about the “community” of cruisers and how they enter, leave and re-enter our lives, sometimes at the least expected moments. I’d say that yesterday was about as perfect an example of how this works as we have encountered yet. 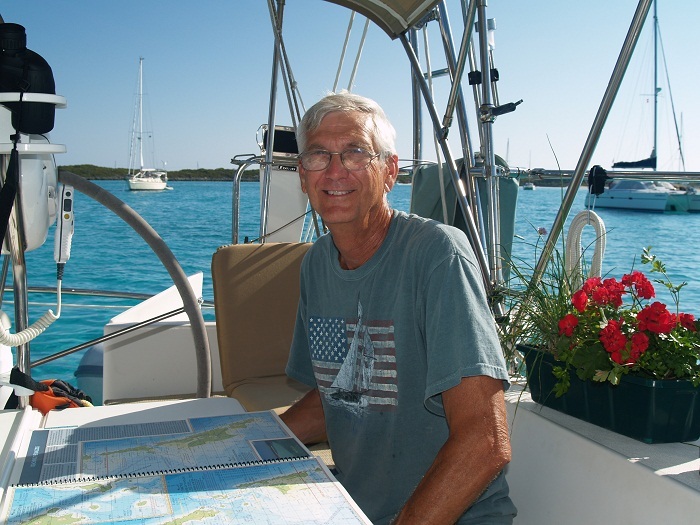 Today Jerry visited again to talk with us, over coffee, to offer tips about cruising in the Jumentos Cays, an area that we have wanted to visit but haven’t yet gone to. It’s off the beaten path and not visited by many cruisers as it’s a bit tough to get to. Perhaps we’ll visit now. Whether, it’s a few weeks or years later, folks we have met come and go from our lives, sometimes having crossed oceans or continents since we last toasted a sunset together. And that’s one of the greatest pleasures of cruising for us. Paper charts are dead! Not!!! It’s Saturday morning and it’s laundry day here for Pandora in Black Point Settlement, Exumas. You may recall that we were here a while back and I was raving about the terrific laundry and barber services of Ida. Anyway, I won’t bore you with all that again except to say that we are looking forward to clean sheets. No, don’t check back to that post to see how long it’s been since laundry. We’re ready indeed. Forgive the digression but clean laundry looms large. However, the real point of this post is about getting around and paper and electronic navigation. Sound boring? Probably, but it’s my blog so there! Some months ago “Active Captain” a well-regarded source of cruising information, announced that paper charts were dead and no longer needed due to the advances in electronic charting and the number of redundancies for onboard navigation. I have to admit that I was skeptical at the time and really doubted that tossing out something as enduring as paper was a good idea. On a personal note, for those that have been reading about our trials of getting around and staying in touch after the demise of our iPad, you may recall just how hard it has been for us to get this resolved. Well, yesterday we finally received our new iPad after some three weeks of effort. That’s a long time and once we had it in hand we spent nearly the entire day setting it up and getting everything reinstalled. Happily, we are now “good to go” and all is back in working order. I know that we are WAY over reliant on our easy-to-use electronic gadgets and have been so for many years. However, I am happy to say that we were indeed able to get around without our electronic charts, using the good old paper chart books. However, even with all systems functioning properly we have always keep paper charts handy and with “electro-problems” we really made sure that we were tuned into the paper world. I have to say that when the iPad pooped, I was very concerned that we had become so reliant on electronics that would be stuck, paralyzed and unable to get around at all. However, as it turned out, while we were slowed down, we were not stopped. I found myself being much more aware of water color as a sign of water depth and I also did a lot of checking the lay of the surrounding islands against what I saw on paper with the hope that I was where I hoped I was. Mostly, yes. Anxious as we were, we did make it around fine so what’s the need for the fancy equipment? Well, I guess that it’s more about confidence and comfort and knowing that we can double check what we think we see against what we see on the plotter. Having electronic charts that show exactly where we are at any given moment is like having a “pilot” on board to validate what we see and provide reassurance that we are where safe and on the right track. Winding between coral heads and sand banks takes real nerve when you are trying to do it without “real time” information from the plotter. Yes, the water is famously clear but even though you can see the bottom most of the time, it’s still tough to be sure. And, “almost right” isn’t quite good enough when you are at risk of crashing into a coral head. What this process has reinforced for me is that the “old fashioned” paper is still great and surely not dead but that it’s just so nice to have an “extra set of eyes” from a plotter to confirm that “yes, Bob, you are on the right track, carry on”. Another take away from all of this is that you can get anything you need in the Bahamas but that it might take weeks and cost a lot. So, what are you willing to pay for peace of mind? In the case of Pandora’s crew, plenty. Speaking of local wildlife… Every afternoon the folks at the Staniel Cay Yacht Club (actually it’s not a club at all but I won’t quibble) clean fish and lobster in preparation for dinner. The food there is very fresh and pretty good actually, and the scraps go into the water to feed the local fish population. 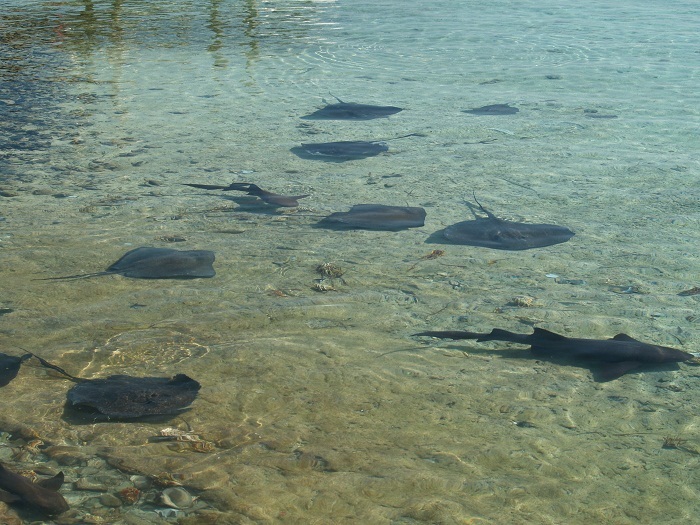 Sharks and rays come in from all over to enjoy the feast. In spite of being in a busy marina, the water is incredibly clear. It almost looks like they are just laying on rock. No, there is some 4’ of water. Really, really clear. There was quite a crowd looking for dinner. So, now that we are all set with our new iPad, after three weeks of waiting, we are again working our way south. Today, laundry and tomorrow we will head further down the Exuma chain and get ready to dodge the next cold front that’s due to drive through the area next week. Yes, another front and this one is now bearing down on New England as a major noreaster (is that how you spell it? Not in spell check). Glad we are not there right now. What a winter they have had. Yuck. Me? I’d much rather be here enjoying another sunny warm day. Have I said that it’s sunny in the Bahamas? And warm? Yes, thought so. With all our equipment back in order it’s a new day so what better way to sign off than with a shot of yesterday’s sunrise in Staniel Cay. Yes, a great day indeed. So, here I am finishing up on this post as our wash is swishing around getting clean. The laundromat has free wifi too. That’s Ida for you. The best laundry and haircuts in the Bahamas and WIFI too! And, of course, all this proves that paper charts are not dead. Right? No, not the best segue to end with. Oh well. No wind. A novel concept, really! 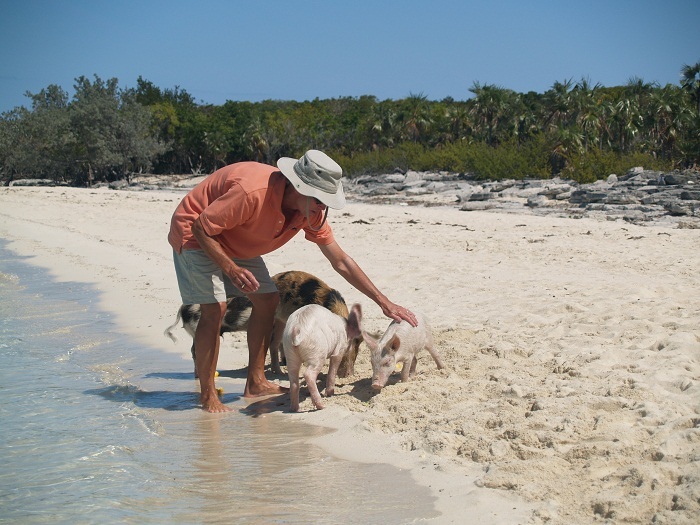 It’s 08:00 on Thursday and we are anchored, again, in Big Majors Spot; the home of the Bahamas piggies. 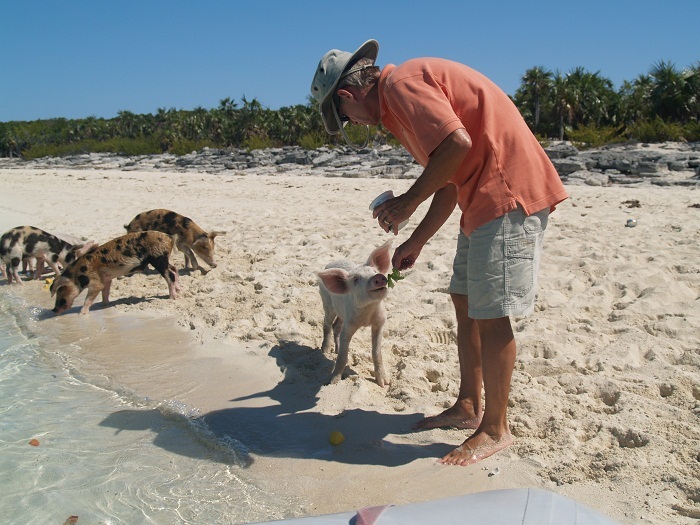 You recall, this island is the one that has “wild” pigs. 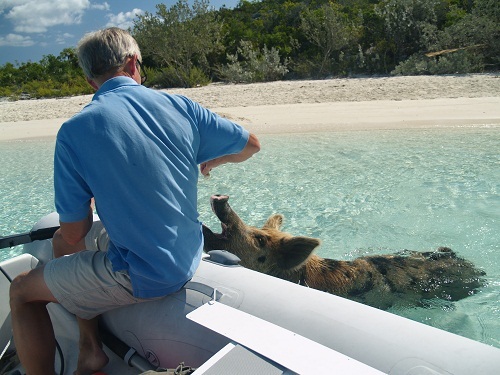 Wild is a relative term as they were clearly put here by someone as this is the only island in the Bahamas that boasts it’s own “native” population of swine. I should also note that there are chickens and roosters here too so if you like to waken to the sound of a crowing rooster, Big Majors Spot is your kind of place. What’s so unique about this morning, following a particularly beautiful sunrise, is that it’s completely calm. With cold fronts coming through on a weekly cycle, and bringing strong winds from a variety of annoying directions, a day without wind is something to talk about. The early morning light is a lovely soft yellow and to see all the boats, and there are plenty here, gently rocking on the water, is a calming sight. I listened to Chris Parker, the weather router, today, as I always do, at 06:30and his forecast is for winds to be from the northeast for the next two days, perfect to send us down to Georgetown, our next destination. 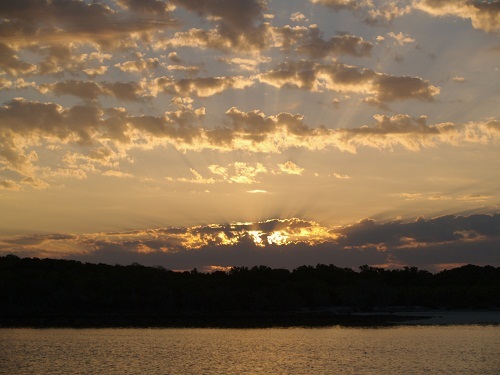 I am hopeful that we will get there before the winds turn against us, which will happen this weekend or early in the week, but that depends on FedEx and Watermakers Air and getting our iPad delivered to staniel Cay, just around the corner. It will actually be fine for us to wait here for a while if we miss this weather window as it’s a lovely place. However, having been in the Bahamas for more than a month now, I am anxious to put some more miles on Pandora and head south. Speaking of sailing, we had a wonderful sail yesterday from Warderick Wells, about 20 miles north of here. The wind was in the low teens from the northeast, a perfect direction to head here. It was nice to be able to set the autopilot and read a book. A very nice sail indeed. We had spent four days in Warderick Wells, which is very protected, to ride out the adverse winds from the last frontal passage. Just as we were getting underway and Brenda was preparing the lunch that we would have while sailing to Big Majors Spot, I tossed some vegetable scraps over the side. A moment later I heard some splashing just off the side of the boat. 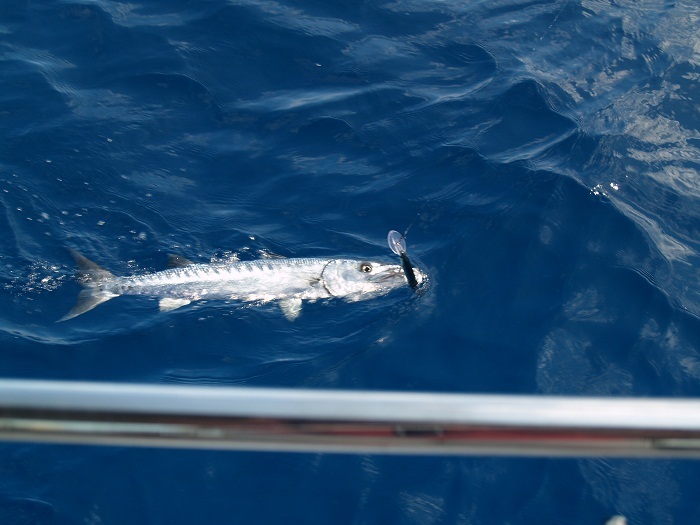 I came up on deck and was amazed to see a number of really large, about 4′ long, ramoras eating our cast-offs. They were darting this way and that, competing for onion skins and bits of broccoli. 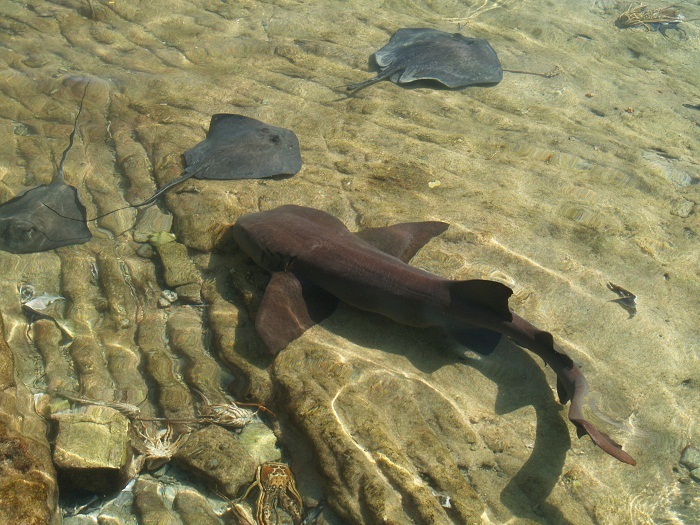 Ramoras have a distinctive patch on the top of their heads that they use to “stick” to sharks and sometimes boats, going along for a free ride. They eat most anything and by “sticking” with a larger shark “host”, I am sure that they have plenty of options. Legend has it that if a remora stuck to the bottom of a sailing ship, that their presence would stop a boat dead in the water. If that’s true, I hope that we don’t pick one up. This shot clearly shows the “sucker”. 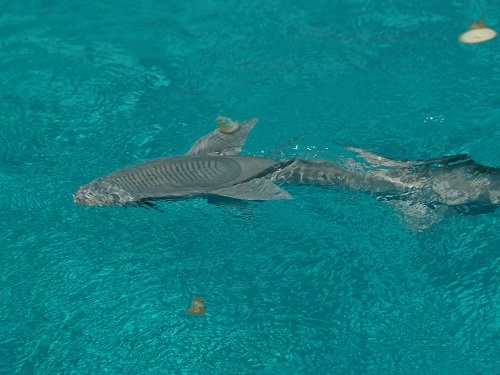 An amazing creature, the Remora. So, today we will find out if there is room on the plane for our packages and if FedEx delivers early enough to make the afternoon flight from Ft Lauderdale. Fingers crossed. If not, perhaps Friday morning. One way or the other, it will be good to have an iPad, a backup for navigation again. Brenda has wanted to do some snorkeling but has been a bit timid about it given the 8′ sharks that always seem to be cruising by. However, I suspect that this fear (a legitimate concern) is giving way to a desire to see the sights. We did see that there is a nice little reef very nearby that is well protected. We took our glass bottomed bucket (look bucket) there yesterday and took a “look”. I expect a visit will be on the agenda today. Well, it’s nearly time for Cruiseheimers on the radio. That’s an SSB Net where folks check in each morning. It’s a great way to hear where everyone is and to connect with friends. It’s also a good way to learn about important issues such as what day of the week it is or if it’s time to move our clocks forward for daylight savings time. As you know, folks who live aboard small boats often forget what day of the week it is. Perhaps we should get one of those tear-off calendars, the type you see in hospital rooms, so we can always know. But, we’d probably forget to tear off the pages each day. As you may know, not knowing what day of the week it is can be a symptom of greater ills, or “cruiseheimers”. Right? Quick… What day of the week is it? Thursday!!! However, don’t ask me the date as I have absolutely no idea. OK, OK, I checked. It’s the 20th of March. That’s what computers are for. Right? Well, it’s Tuesday morning and the winds are strong from the west, again. That’s not a normal direction for this area of the Bahamas and certainly not this late in the season. However the pattern of cold fronts penetrating into the area about every six days continues, unabated. Fortunately, we are tucked into one of the few harbors in the Exumas that offers protection from the west so it’s very calm, even if it’s windy. However, there is hope that things are improving as this front isn’t as strong as the last few have been. The unrelenting fronts have been the topic of discussion among cruisers here who say that they have not experienced adverse winds and fronts like this in the Bahamas in many years, with the exception of this year and last. Of course, the last two years have been out total experience, so to us, the weather is always “like this”. Don’t get me wrong as the “like this” weather is pretty good compared to good old New England. While our friends are experiencing relentless snowfall, we see views of clear blue water and powder fine white sandy beaches. Yes, there’s white here too but it’s not quite the same, somehow. That’s good, very good. Yes, there’s even a bit of white in this photo from yesterday when Brenda and I went for a walk on the beach with some friends. Love the gentle lapping of wavelets on the beach. I’ll take white puffy clouds and sand over drifts any day. See the two dinks anchored in the shallows in the distance? One’s ours. Pretty bucolic. As I have mentioned, no actually whined about incessantly in past posts, we have been “e-challenged” with the demise of our iPad a few weeks ago. We are hopeful that this will be resolved soon, perhaps in just a few days. It’s expected to arrive in Staniel Cay very soon. Yahoo!! Thanks to our son Rob for handling the logistics from “State Side”. For the last few weeks Brenda and I have been “buddyboating” with our friends Loreen and Miles who live aboard Ariel, a wonderful boat. They have been living aboard full time for about the last six years and spend their time running from the Bahamas to Maine and back each year with an occasional run back to Wisconsin, where they keep a “land home”. We have been swapping off on dinner prep most nights. It’s fun, sometimes too much fun actually, to spend evenings with them. We hope to see them again in Essex in June. After we pick up our iPad in Staniel in a few days, we hope to make a run down to Georgetown, a very popular cruisers hangout in the southern Bahamas. We’ll be able to visit a “sort of real” market there to re-provision. We haven’t been to a market that has any real choice since leaving Nassau a month ago. The lardor is pretty sparse, as you can imagine. 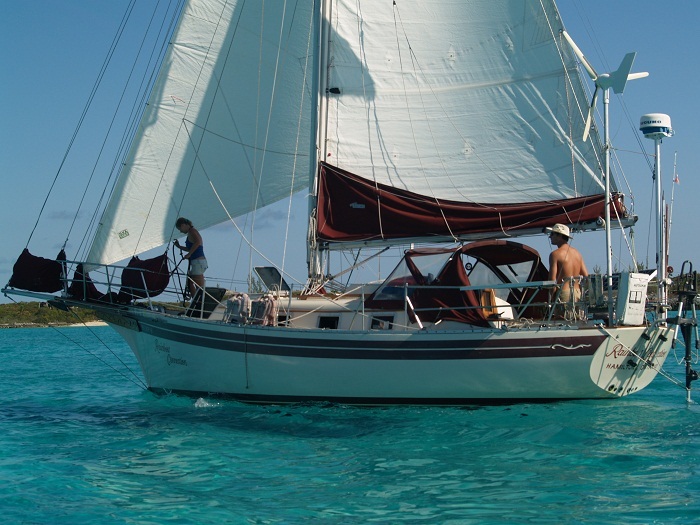 In April we are hoping to connect with our friends Maureen and Bill aboard Kaloona Moo. They have been in the Caribbean since November and are currently in Puerto Rico. They will be heading north towards the Bahamas on their way back to New York, where they spend summers. We’ll likely hook up with them south of Georgetown. We are very interested in hearing about their time in the Caribbean and what it’s been like. As Brenda’s “guardian angel”, no make that “guard dog”, Maureen won’t let me take Brenda somewhere where she will be unhappy, so we should get a pretty good feel for what it is like down there for girls like Brenda, self-described “cream puffs”. I did get a note from them a few days ago and have spoken to them on the SSB radio as well. One thing that they did mention is that the weather is a lot more settled down south as the fronts that have been vexing us here just don’t come down that far. Yes, the trade winds are quite strong with winds blowing in the 20s each day. However, when you anchor you are sheltered behind volcanic islands that soar thousands of feet into the air. As a result, the winds are blocked and anchorages are calm and settled. After months in the Bahamas with unrelenting winds we are probably ready for “settled”. Perhaps that should be our destination next year. I guess we will soon learn more when we hook up with Bill and Maureen to get the “download”. Don’t get me wrong, the Bahamas are beautiful and WARM and it’s certainly better than being in the grips of a sub-zero winter. Am I sounding a bit whiny? Perhaps, but I am told that writers with angst are more interesting. I guess you’ll have to be the judge. Oh yeah, I should mention that this post was set to our son Chris, who is now in San Francisco making some contacts in the tech area. The routine, given our “e-challenges”, is for me to send the text and a single picture to him via our long range radio, the SSB. Chris then takes the text and photo and posts them on my blog. Interestingly, the “node” that I am using to connect to send this to Chris is located in Panama as that location has the best “propagation”, or signal, this time of the day. The way it works is for my radio to send out a signal that “bounces” off of the upper atmosphere and then back down to the receiver in Panama. Pretty amazing, actually. Thanks Chris. 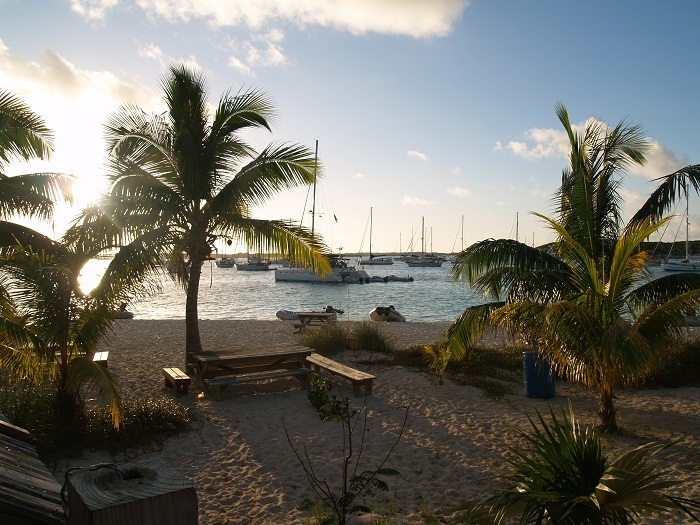 It’s Saturday morning and we are once again anchored near Staniel Cay. On the one hand, I am not unhappy to be in what is a very nice spot having already been here twice this season. However, we are still trying to get the problem with our “mort” iPad resolved. If you recall, we use this as an important navigation device here in the Bahamas and having it die some two weeks ago has left us with no good backup and anxiety about getting around with confidence. Yes, we have a plotter with charts as well as the paper chart books. However, for close in work, in narrow channels, it’s nice to have the extra detail that shows on the i-Pad. After a week of messing around with an order from Apple, we discovered that they won’t ship to a “re-shipper” and canceled our order. The package was supposed to be mailed to an air-freight company in Ft Lauderdale and then to be flown to Staniel Cay in the Bahamas. As we were receiving e-mail via our iPad, we were unaware of the cancellation until we saw their cancellation notice a week later, very frustrating. Frustrating indeed. First we scratched our heads trying to decide what the best option was. Then we sent a note to our son Rob in MD and he agreed to order an i-Pad and to ship it to Watermakers Air Airfreight, the “re-shipper” that Apple wouldn’t send to, in Ft Lauderdale. They run flights to Staniel Cay daily and can drop the package there for us. Alas, it seems that it’s not that simple as I have been frustrated in getting them to respond to my messages. Given the starts and stops of the iPad order, I guess that they have decided that this order has become too complicated and confusing. Whatever the reason, they have not been very responsive and getting an answer from them has been spotty at best. One way or the other, I am anxious to put this episode behind me and to get on with our run south to Georgetown and the southern Bahamas. Yes, yes, I do realize that this sounds very whiny given the fact that we are sailing in some of the most beautiful waters in the world. However, it can be treacherous making our way around without good charts. Shifting shoals and lots of “hard stuff” to bump into make getting around here iffy at times. That’s why we need to have access to good charts and a way to see exactly where we are. And, the iPad app, Garmin Blue Charts, gives that. Besides, having backups for key systems is critical. I realize that we have become perhaps over-reliant on electronic charts, but it’s just easier and less stressful to use them than to rely on paper charts as the primary course of getting around. I can do it but would prefer not to have it be any harder than necessary. What I have learned from this exercise is that for some systems having a backup to a backup is important and that some who have called for the end of paper charts are just barking up the wrong tree. Enough whining about charts for now and I hope that we will be back on track (chart wise) by next week. Today is a beautiful day and we are expecting, yet again, a front to hit us, albeit less powerful than the one we “enjoyed” the other day, to pass through here early next week. With that in mind, we are headed back to Warderick Wells again this afternoon so we will be in a well protected spot when the wind veers west for a bit. 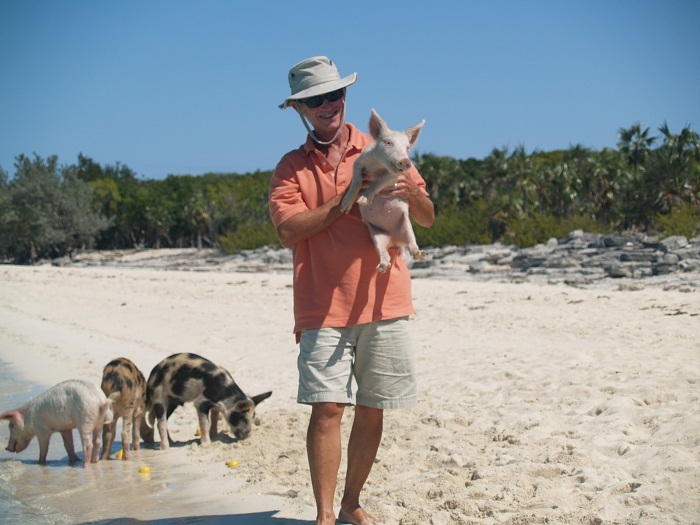 Anyway, perhaps I will close with a photo of us feeing the wild piggies near Staniel. Actually, they look pretty wild from close up. Ok, ok, they not so “wild” but they are piggies, never the less, and very close. Here’s to hoping that we will be free to move on soon and have our navigation “issues” resolved, once and for all. Fingers crossed. No make that “piggies” crossed. Oh yea, thanks to our son Christopher who has been posting these for me since we have been “Net-compromised”. Thanks Chris!!! One of the things that Brenda and I really enjoy doing is shell hunting. It is just so pleasant to wander onto a new beach and wade through the shallow warm waters, to see what has washed up on the beach. We have found, over the last two winters, that each beach has it’s own characteristics that make every day of shell hunting a unique experience. You’d think that shelling on the ocean side would be great but that’s actually not the case. It would seem logical that the surf would wash up shells. However, we have found that on beaches with big surf that the shells are mostly broken up and those that you do find are quite damaged or worn down by the constant action of the waves. As the surf rolls in and tumbles shells in the churning sand, what you find is pretty well worn. Of course, one exception is sea glass, pieces of broken bottles that are worn smooth by the surf. However, we actually find very little glass bits. The one thing that washes up in great quantities on the ocean side, however, is plastic trash. It’s pretty depressing actually to see literally hundreds of plastic oil cans and other non-biodegradable items strewn along the beach. In many areas, cruisers gather up the trash into piles which helps minimize the mess. Unfortunately, any plastic that finds it’s way onto beaches will persist for dozens of years. Even after a long time plastic bottles are still around even if they have become brittle from exposure to the sun. Over time they become brittle from sunlight and break into tiny bits but they never really go away. It’s unfortunate that people are so casual in tossing things overboard. Given the number of items that wash up on beaches here have writing in Spanish, I suspect that much of the trash floating around has probably come up from the Caribbean via the prevailing winds and the Gulf Stream. Someone told me that in Haiti trash is just pushed into the water where it floats away with the wind and current. I don’t know if that’s accurate but it’s certainly not good to hear. Interestingly, you don’t find much trash on beaches that are west facing, away from the ocean here. That suggests that the Bahamians and visitors are pretty good about not tossing garbage into the water. That’s encouraging. Well, back to shelling. 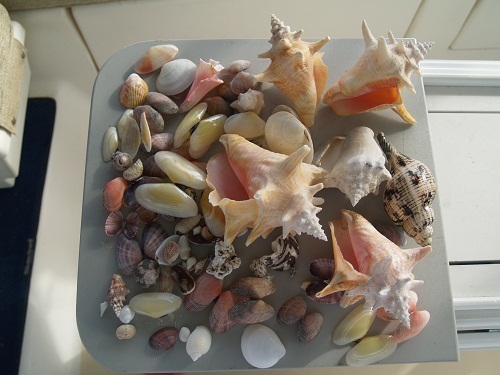 No, you don’t find great shells often on the ocean side but on the west facing Bahamas Banks, the shelling can be quite good. As the wave action is minimal those shells that wash ashore tend to be in quite good shape. The great variety of shells is amazing. Interestingly though, you tend to find many shells of the same kind on any given beach with little variety at a particular location. In some spots sand dollars are very common and on others colorful “tellins”, which come on yellow, red and purple are everywhere. These little “clams” are, not surprisingly, called “sunrise” tellins if they are yellow and “sunset” if they are purple. This photo shows the shell diversity from one of our recent outings. We particularly love the small or juvenile conch shells, the ones with the points on them, but finding them isn’t all that easy and most of the time they are alive, so we put them back. This photo has a number of really nice little juvenile conch. We tend to find the little ones on exposed sandbars at low tide. I suspect that these little guys wandered into shallow water and were exposed to the sun for too long at low tide. The juvenile conch look similar to the adult but much more delicate. When conch are about 1′ long they are harvested as a major food source here in the Bahamas. As I finish up this post it’s mid-morning on Wednesday and were are expecting the wind to increase a lot over the next 24 hours and swing around to the west for a bit as the cold front passes through the area. 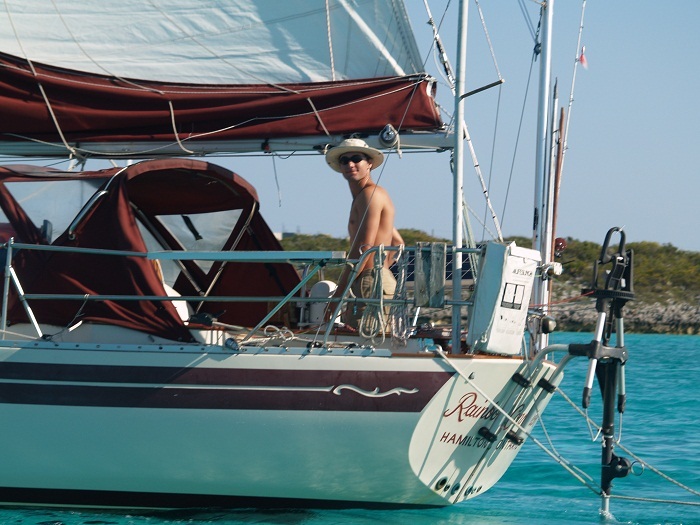 After the winds settle down, from forecasted speeds in the high 20s, we will head down to Staniel Cay, a short distance away, to pick up our new iPad and parts for the watermaker. After that, we hope to head south to Georgetown and our next opportunity for a “real” food market. However, with one cold front after another coming through these days, we may have trouble finding a “weather window” long enough to make the 75 mile run south to Georgetown. Well, I guess I should be getting on with my day so I’ll sign off now.